i hadn’t thought about this. wierd. do people really care if there is a pulpit or not? sounds kind of stupid to really care. shouldn’t the preaching be more important? good questions though. youth pastors don’t use pulpits very often. i don’t. Pulpits within Evangelical Reformed churches have always represented the primacy of the Word of God. It is a recognition of one of the five pillars of the Reformation – Sola Scriptura. We must somehow maintain this distinction from other “churches” without maintaining barriers to Truth and without losing the Truth. This often becomes more difficult than we realize. Tony, youth ministry degree teaches not to use pulpits? Wow. I am interested in that. JHOLMES – amen! Do you think PCA and OPC will change? Have they changed? My pastor has a pulpit but doesn’t seem to stand behind it very often. Wait, is the pulpit the item that holds the bible and notes or is the pulpit something that has stairs and is above the congregation? What’s that picture of? I really appreciate this post, as well as the wider conversation of the ways in which our architectural and design choices tell their own stories. No just kidding (not really) I am much more engaging and free without mine. I use a loose outline with sticky notes in my bible so I am mobile. That’s just the way I like it. Nothing between me and the priests. 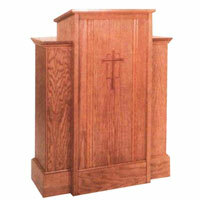 On the other hand If I were reading my sermon as a manuscript the pulpit (as small as possible) is a great idea.